The Incredible Hunt | What was she thinking? · To strengthen ties and foster bonds among the Business Department students. 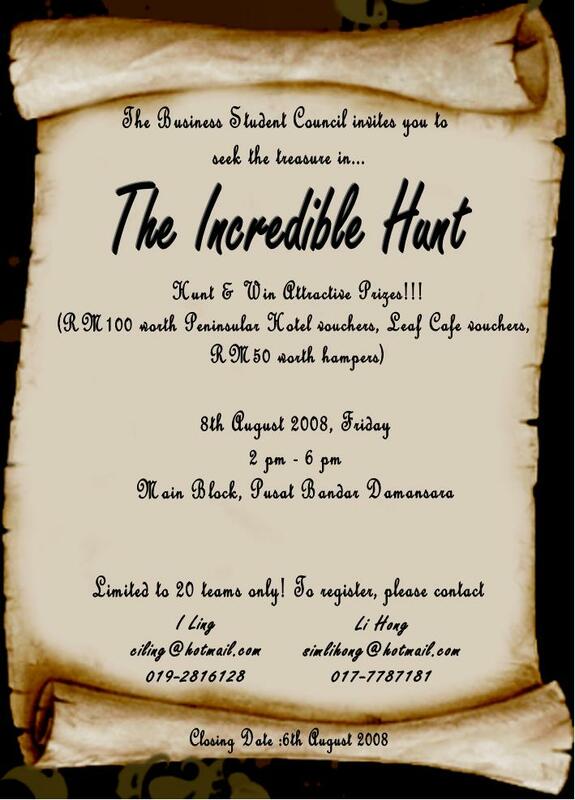 As you can see, for now, this event is ONLY for HELP Business Department students. So why don’t you inject some spontaneity into your Friday afternoon? After all, you have nothing to lose and everything to gain. RM6 for a day of fun. Where else can you get that? don’t get me started on the petrol price, popcorn, parking ticket, bowling..etc etc. « Goodbye Blogspot Hello WordPress! we’ll bearing opportunity costs all the time anyway, every single min we spend not working is an opportunity cost but we can’t work all the time, we need leisure time, which will in turn increase our productivity. By then, our salary will be more than rm40. NO WONDER YOU WERE ASKING ME WHETHER WORDPRESS WAS “GOOD OR NOT” LOOLL . sneaky sneaky. LOL nooo i asked whether livejournal good or not! Are you thinking what I’m thinking B1?